Game on for Abortion Access! But, fundraising for abortion is…not something I’ve done before.You won’t be alone! We’ll regularly provide you with tips and tricks to make sure you have what you need. What if I can’t make it to the celebratory wrapup event?We’ll miss you! But that doesn’t mean you can’t be part of a team and fundraise for DCAF! A great deal is done online, so as long as you have an Internet connection, you can help out. 2018 was a big year for DCAF. 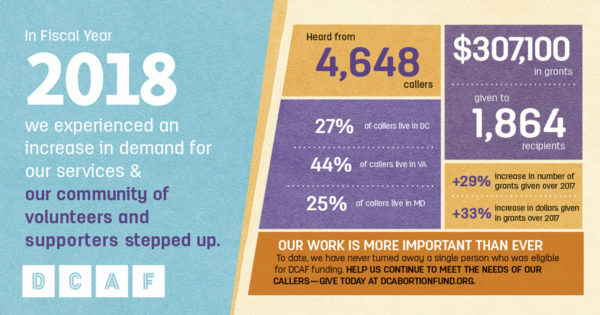 Under a new administration that has already proven itself to be hostile toward reproductive rights, it was also a year that DCAF supporters increased their support of access to abortion care for patients in the DC, Maryland, and Virginia areas. Your support made a direct impact in meeting the needs of patients. You can view our FY18 annual report here. I’m so proud of DCAF’s leadership team and all the work done as part of this incredible organization. I can’t wait to see what we can do together in 2019 and beyond! Editor’s Note: Catholics for Choice is a sponsor for our holiday party. Thank you to the entire Catholics for Choice team for your work and your support. All answers below are attributed to Glenn Northern, Director of the Domestic Program at Catholics for Choice. I’ve spent a decades-long career protecting access to reproductive health—and I know firsthand that although abortion is a fundamental right, access to abortion care is far from equal. I recall my early days when I was a hotline operator at the National Abortion Federation (NAF) when they deployed only two operators for the whole country. We received many calls from women who were not able to pull together the money to fund their abortions and it was heartbreaking. Very few places existed to help at that time. DCAF has rewritten the script for many women enabling them to get the care they need and Catholics for Choice supports that work of DCAF because we believe that every woman should be able follow her conscience with regard to very consequential decisions around pregnancy. No one should have to choose between whether or not her family eats or whether she can get an abortion. At the time, NAF resided in the very same building as Catholics for Choice where I now go to work each morning to safeguard those rights. At Catholics for Choice I am privileged to represent and amplify the voices of prochoice Catholics. We lift up the lived expression of Catholicism as everyday Catholics around the world see it. Catholics for Choice trusts women and men to make their own moral decisions on abortion and motherhood, important moral matters including reproductive health. For me it’s a dream living out two crucial parts of my identity as a feminist and Catholic. I could not be more proud of the work we do to ensure that every woman is able to follow her conscience and make whatever decisions about her pregnancy are right for her. That is why we launched an Abortion in Good Faith pledge to lift up the voices of others, like me, who believe social justice means ensuring everyone can access the reproductive care they need. Most recently we saw how Oregon reaffirmed its commitment as a model of progress by defeating measure 106 and maintaining protections so that all Oregonians, including those on Medicaid insurance, can get abortion care. Catholics for Choice joined the No Cuts to Care Campaign to defeat the ballot. We helped organize Catholics and give them the space to talk about why their values of compassion and social justice compelled them to support equitable and comprehensive reproductive care for all. Together with our partners, we wrote editorials, ran English and Spanish language ads in local papers and radio stations, and spoke up on social media to lift up these voices and stop attacks to strip care from those with the least resources to fight back. We reached out to immigrant Catholics who were going to be disproportionately impacted by these cuts to care. On Tuesday, November 6, 2018 we won. The Coalition handily defeated Ballot Measure 106. In fact support for equitable abortion access received more total votes than any statewide candidate or initiative on the ballot in Oregon. Growing up Catholic in NY I always knew I wanted to help people, that I was called to a life of social justice. This latest victory exemplifies the reasons that drove me to this work in the first place, and sustain me now. We were proud to be a part of that campaign. We are always proud to stand up for the rights and conscience-based decisions of women. That is why we are proud to stand with and support DCAF and its work. We are both grounded in the critical work of lifting up the conscience based decisions women make about pregnancy. Freedom itself is inextricably linked to the ability to exercise one’s conscience and determine one’s future including one’s reproductive future. That is why we remain as committed as ever and count our blessings in partners like DCAF who help put the justice and choice back into prochoice for the lives they touch. January 22, 1973 is an important day for reproductive rights. It was the day the Supreme Court announced its decision in the Roe vs. Wade case—its decision to legalize abortion in the U.S.
Roe Day provides us with an opportunity to reflect on the implications of Roe and the strides we have made together as a movement. It is also a time to recognize that this constitutionally protected healthcare service remains out of reach for many people because of political and economic barriers—barriers that disproportionately impact people with lower incomes and people of color. We’ll be attending an event at Upshur Street Books with author and reporter Robin Marty. This event is free and open to the public, but you can pre-purchase a copy to reserve your seat! Join the Washington, DC Lawyer Chapter of the American Constitution Society, the Constitutional Accountability Center, and the DC Abortion Fund for a discussion of the legal threats to reproductive justice and the future of Roe v. Wade under the new U.S. Supreme Court. This year, we are grateful. Grateful for generous supporters like you, for our strong community, and for the partners and activists who stand with us on the frontlines for reproductive and social justice. The role and growth of abortion funds have perhaps never been more critical. As we face increasing and frightening state restrictions on abortion access and an uncertain future with the courts, we continue to work every day to make reproductive choice a reality for everyone—regardless of income. This year we’ve provided hundreds of thousands of dollars to patients to cover the gap between what they are able to pay and the full cost of abortion care. We’ve assisted more callers than ever before. This holiday season, give the gift of hope. Please help us start 2019 strong with a generous gift today. Despite the obstacles to come, we remain committed to our mission and our work. DCAF will remain ready to be a resource. And we are only able to do this because of you. To make an impact throughout the year, please consider making a monthly donation to DCAF! You can make your monthly, or one-time, gift at dcabortionfund.org/donate. What a year! We’re still pulling together the final numbers for our annual report, but we already know we’ve shattered previous records. We’ve provided hundreds of thousands of dollars to patients to cover the gap between what they are able to pay and the full cost of their abortion care. We’ve assisted more callers than ever before. And all this in a world with a decidedly anti-choice administration and a multitude of state and national restrictions designed to deny access to abortion care. So much of this success is thanks to people like you. Now, we celebrate! Join us next month to toast our incredible community at our annual holiday party on Monday, Dec. 10. When: Monday, Dec. 10 at 6:30 p.m.
Get your early bird ticket for a suggested donation of $25 today! If you or your organization are interested in giving at the leadership level for this year’s event, please click here to learn more about sponsorship levels and packages, starting at $100. The funds raised for this event — like all donations to DCAF — will help to continue to make abortion accessible for all. So how does this work? Covering the cost of your abortion. After you’ve decided to have an abortion, there’s the matter of paying for it. 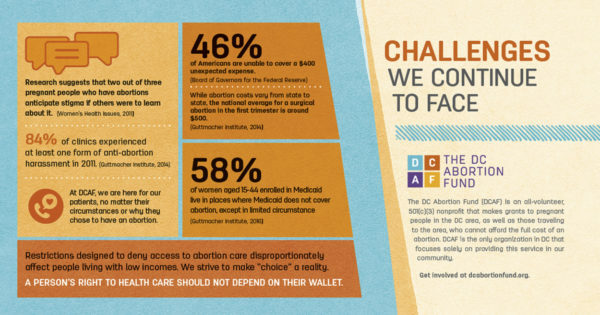 Volunteer case managers at the DC Abortion Fund are here to guide you through the sometimes challenging process, but we also put together this brief set of questions and answers about covering the cost of your abortion. It varies. The cost of an abortion can depend on a variety of factors, including your health, the clinic, and the stage of your pregnancy. Abortion care can cost anywhere from a few hundred to several thousands of dollars, depending on a variety of factors including the patient’s health, how far along they are in their pregnancy, and which clinic they’re going to. It depends. Health insurance can reduce the cost of an abortion. A few states require insurance plans to provide insurance coverage of abortion while several states deny access to insurance coverage of abortion. The Hyde Amendment has paved the way for federal abortion coverage restrictions for patients on Medicaid, CHIP, and other federally-funded insurance programs–although some states use their own funds to cover abortion for Medicaid enrollees. Your insurance company will be able to tell you whether they cover abortion care. Like any other medical procedure, it’s important to find out which providers and services are included in your plan. If you’ve still got a balance after pulling together your resources, organizations like DCAF, the National Abortion Federation and other abortion funds around the country may be able to help make up the difference between the cost of your procedure and what you can cover. Will my parents, partner, school or employer find out I had an abortion if I’m on their insurance? Your confidential health information, including the result of a pregnancy test or an abortion, is protected under the Health Information Portability and Accountability Act (HIPAA). However, if a parent or partner is the primary insurance policyholder, they may receive an explanation of benefits (or EOB), a document that may be sent whenever care is provided under a policy that itemizes submitted claims. Some states require or presume that your medical provider will send an EOB. This may be simply a line stating the name of the provider or office and the amount billed, but it may include more information. So while your abortion provider will keep your health information confidential, the explanation of benefits may provide information about the medical services you receive. And if you are insured as a dependent, this EOB may reach your parent or partner if they are the policyholder. Ask your care provider how services will appear on insurance paperwork, or research the laws and policies of your state. If you have insurance through your school or job and are the primary policyholder, the EOB will go to you, as the primary policyholder. But some schools or employers refuse to cover reproductive health services, such as contraception or abortion, meaning that you may have to pay the entire cost out of pocket. If you are a minor, in addition to confidentiality concerns surrounding EOBs, your ability to access abortion or reproductive health care depends on where you live. Different states have different policies when it comes to parental consent, so it is worth looking up the laws in your state. In DC, minors can consent to abortion. In Maryland, minors seeking abortion need to notify their parents, and in Virginia they need both parental notice and parental consent. Organizations like Jane’s Due Process have great information and resources around access to abortion care for minors. Can I talk to someone about whether this is worth the expense? We at DCAF affirm that you are the decision maker in your life. While we do not offer options counseling, we do offer financial counseling, should you decide to obtain an abortion. If you are interested in options counseling, we can refer you to an organization that may help. Looking for a question/answer you didn’t see? Click here for more information about funding an abortion. Need help? Please call DCAF’s free, confidential helpline at (202) 452-7464 and leave a voicemail for our case managers. Include your name and phone number, how many weeks pregnant you are, the date of your doctor’s appointment, and whether or not it is okay for us to leave you a voicemail. Here’s a link to more resources.